Radford Green of Sedgebrook began offering a program to its memory care residents in October that has people singing its praises – quite literally. In addition to its current roster of activity programs, the senior living community recently invited Songs By Heart to visit three days a week. The organization offers professionally trained vocalists and musicians to lead interactive sing-along programs to engage with residents. The results have been remarkable. In addition to toe tapping and finger snapping, many residents will also sing – an activity that for some was lost years ago as a side effect of dementia. 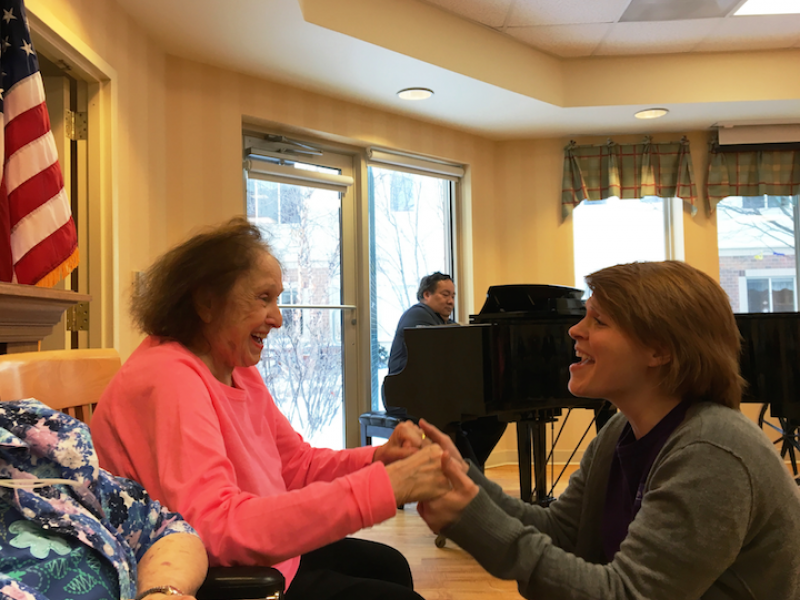 It is the interaction the vocalists make with the residents as they sing songs, either by holding hands or making eye contact, that touches on the social, intellectual, emotional and spiritual aspects of wellness, Seaberg says. Research indicates that music can shift mood, stimulate positive interaction, coordinate motor movements and facilitate cognitive function, and staff at Radford Green can certainly attest to noticing those improvements in residents during the music programs. Community leadership visited a Songs By Heart performance and knew immediately it was something they wanted to bring to Sedgebrook. When the performers came and performed a short demonstration of their act, it only took one song to notice a change in the memory care residents who live with dementia and Alzheimer’s disease. Songs By Heart is designed for residents living in memory care neighborhoods, but it draws in spouses living in independent care for some quality couple time. In fact, the staff at Sedgebrook recognize just how important music is to the residents that a player piano is located in the memory care wing, and upright pianos are located on the other floors for impromptu sing-alongs between staff and residents. Those locations are also used for other weekly live musical entertainment including guitarists, violinists, accordionists, flutists, saxophonist and vocalists. Sedgebrook is a Life Plan Community offering a diverse lifestyle, maintenance-free living and outstanding amenities. Five-star rated Radford Green Health Care and Rehabilitation is located on the 92-acre Sedgebrook campus in Lincolnshire, Illinois. Sedgebrook is owned by Senior Care Development LLC and managed by Life Care Services LLC. For additional information visit www.WelcomeToSedgebrook.com or call 847-901-3319.